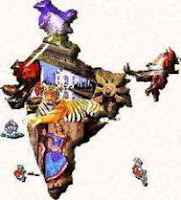 India GK Question Sample Paper 1: India General Knowledge (GK) Sample Question Paper No. 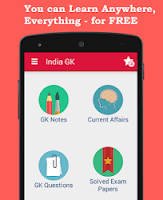 1 with Collection of India GK Questions under GK Quiz in PDF @ India GK Sample Papers. 1. The Mehrauli pillar inscription belongs to the period of the ? 2. Moti Masjid in Red Ford, Delhi was constructed by ? 3. Who introduced the principle of Doctrine of Lapse ? 4. Which one of the following nations was the first to start sea trade with India ? 5. Which one of the following dynasties was ruling at the time of Alexanders invasion ? 6 . Which one of the following works deals with the history of Kashmir ? 7. Who estimated the Indian National Income and criticized the constant drain of wealth from India to England ? 8. In which of the following is the Brahman the Central Theme ? 9. The Moplah Rebellion broke out in ? 10. The concept of Avataravad is associated with ? 11. The Govt. of India Act which ave eparate representation to the Muslims was the act of ? 12. In 1857 the first shot from a rebels gun was fired in ? 13. The difference in years betweek Vikram Era and Christian era is ? 14. Which of the following Jain doctrines is considered as the origin of Mahavira ? 15. The beautiful wooden railings in the sanchi stupa were made during the reign of ? 16. The theory of Agnikula is related to the origin of ? 17. Direct Action was the brain child of ? 18. Tripitakas are sacred books of ? 19. In which of the following respects the various Harappan sites a marked uniformity?